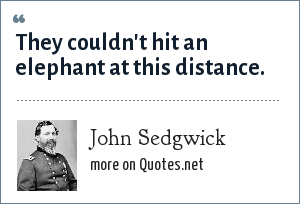 John Sedgwick: They couldn't hit an elephant at this distance. John Sedgwick was a teacher, a career military officer, and a Union Army general in the American Civil War. "John Sedgwick Quotes." Quotes.net. STANDS4 LLC, 2019. Web. 24 Apr. 2019. <https://www.quotes.net/quote/59606>.